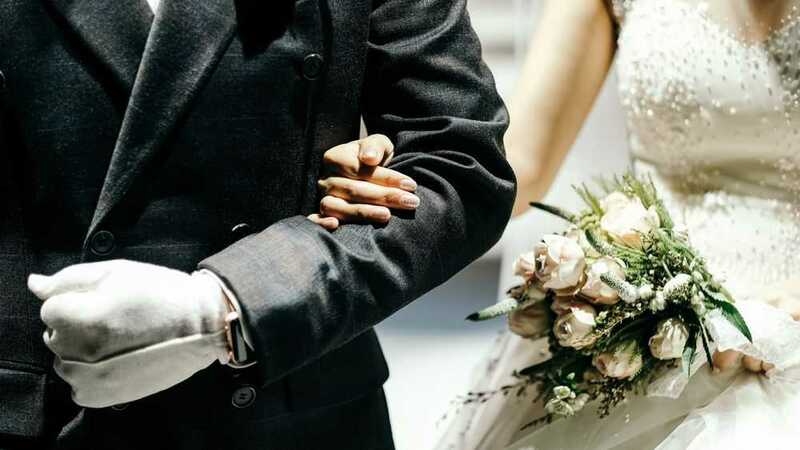 When you look up wedding outfit guidelines, you’ll find a treasure trove of good ideas for the bride and the groom. There’s no dearth of fashion tips for the maid of honor, the bridesmaids, or the mother of the bride either. It’s also easy to figure out how the best man should dress. However, you might find it a little harder to find outfit rules for the father of the bride. If you’re a bride-to-be, there’s a chance your dad will ask you for advice. Let’s look at the dress code he needs to follow. The good news is that there isn’t any elaborate etiquette here. The father of the bride can simply wear a high-quality suit that he feels comfortable in. As long as it’s well-cut and an appropriate color, there isn’t much chance of a fashion faux pas. But there are a few key pieces of advice that can help him put together the best possible outfit. The most formal weddings require a white tie outfit, which includes a white starched shirt and a Marcella waistcoat under black coattails. White tie weddings are rare these days, and your guests should only wear this kind of outfit if it’s specified in the invitation. Black tie weddings are only slightly less formal. Tuxedo weddings are more common. If the groom is going to wear a tux, the father of the bride should do the same. But if the groom prefers a suit, wearing a tuxedo might be overkill. In the case of casual weddings, the father of the bride should opt for a blazer or a light summer suit. An overly formal wedding outfit can look strange in wedding photos, and other guests might have a negative opinion about it too. On the other hand, going overly casual could be interpreted as insulting. The father of the bride should try to match the male members of the wedding party. While it’s important to take the groom’s outfit into consideration, the father of the bride should also not copy him. If the groom, the best man, and the groom’s father are in matching suits, the father of the bride should opt for a different color or cut. Again, it’s useful to think of the photographs. 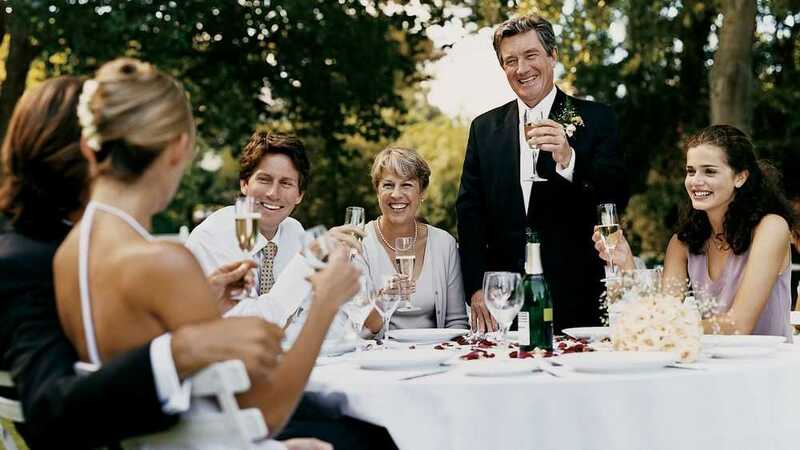 The bride’s family should form a unit, and that means creating a slight visual contrast compared to the groom’s family. In order to choose the right outfit, your father needs to know what to expect from the wedding. It’s important to make sure he knows what kind of decorations you have in store. If it’s a themed wedding, your father should be notified in good time. Beach and backyard weddings tend to be very informal. In this case, we recommend light blue, tan, or light grey suits. Additionally, lighter colors are a good choice for weddings that are held in the daytime. While he should choose colors that suit him, there’s no reason why the father of the bride should stick to gray or black suits. We also recommend light colors if it’s a spring wedding. Autumn and winter weddings tend to have a slightly more formal air. In this case, it’s fine to experiment with different textures. Velvet and corduroy can be a good fit, and navy and charcoal are always acceptable color choices. Unless the wedding is very formal, it’s better to avoid wearing black. While this color looks dashing on some older men, others may look too pale when they wear a black suit or tux. Brown or camel materials are a good alternative. Aging changes a man’s coloring and it also has an impact on his body shape. It’s important to find an outfit that fits perfectly, with no wrinkles or sagging. 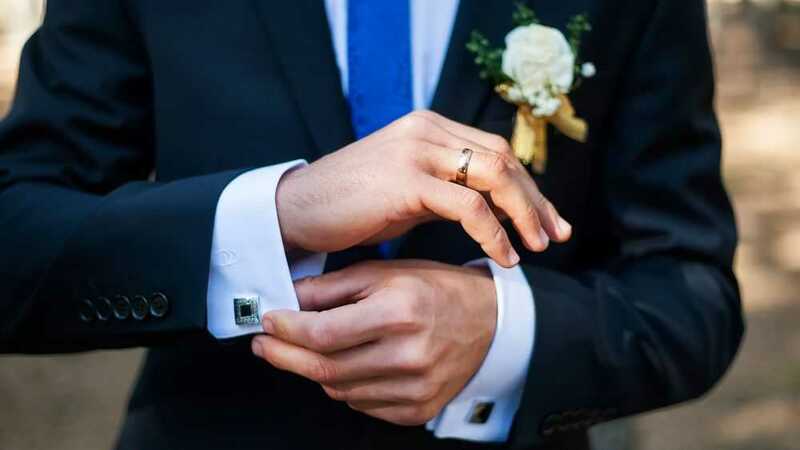 Some men use professional help to select the perfect option or have their suits tailored for the occasion. The father of the bride should place a particular emphasis on choosing the right tie, the right cufflinks, and an appropriate waistcoat. It’s fine to go a little more lavish than usual, as long as everything matches and fits the tone of the wedding. He can’t go wrong with leather shoes. Double-monk straps are appropriate in the summer. If your father is going to wear a wintery velvet suit, it’s a good idea to choose velvet footwear too. For your father, the most important part of the wedding happens right before the vows are sealed. When he walks you down the aisle, everyone’s attention will be on him. 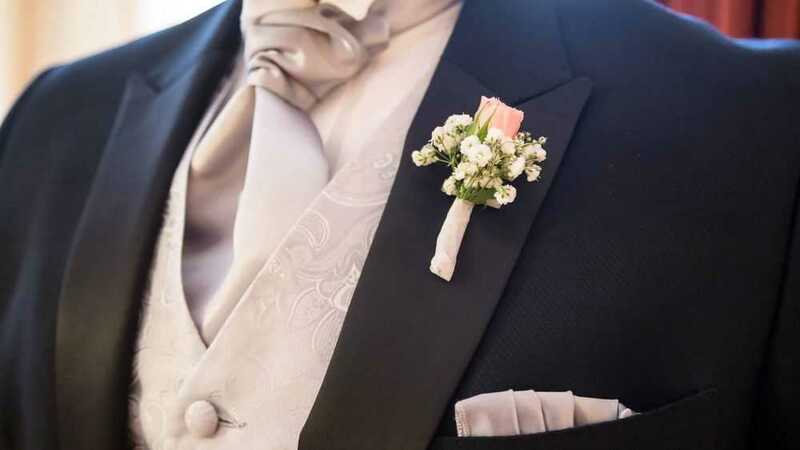 He might prefer to dress up extravagantly for this moment, and the best way to do that is to wear a really impressive boutonniere. We recommend a real flower for the boutonniere. It can be a good idea to match the bridal bouquet, though it’s not absolutely necessary. Roses and carnations are the most traditional flower options, but there’s no reason why he shouldn’t branch out. Since they’ll be spending a significant part of the evening together, the parents of the bride should make sure their attire matches. This usually isn’t a problem, as most couples like shopping together. However, some brides have parents who are divorced and not on particularly good terms. If this is the case for you, don’t force the issue of matching outfits or shared photos. Most of the above advice applies to the father of the groom as well. But unlike the father of the bride, the groom’s dad can simply match his outfit to the rest of the groomsmen. 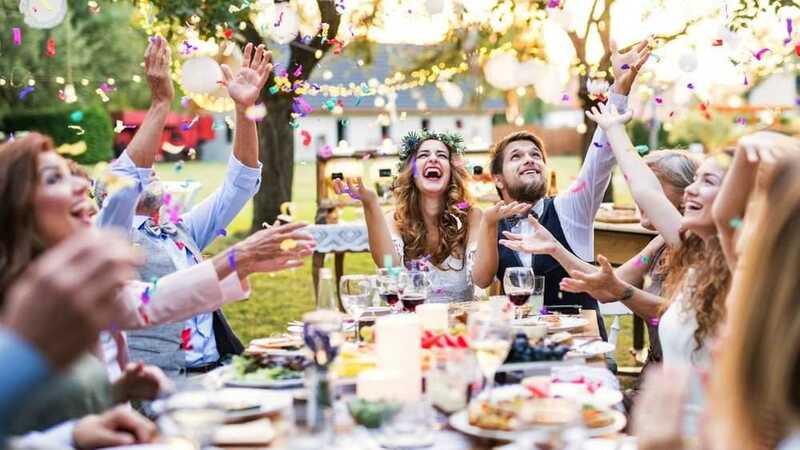 You want everyone at your wedding to feel happy and confident, but you may be especially anxious about your nearest and dearest. To make sure the evening goes well, you might want to be as flexible as possible. Even if it doesn’t exactly match the dress code, your father should choose an outfit he’ll love wearing.